Weighty Matters: The City of Toronto pushes Coca-Cola on children. 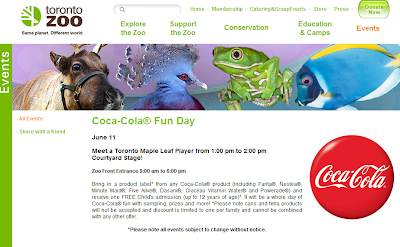 June 11th is "Coca-Cola Fun Day" at the Toronto Zoo! The Zoo, owned by the City of Toronto, is offering children under 12, free admission to the Zoo if they bring in a Coca-Cola product label. And what will they get aside from admission? "It will be a whole day of Coca-Cola® fun with sampling, prizes and more!" Should the City of Toronto really be helping to push, sell and polish a brand whose products are so excruciatingly linked to excess calories and childhood obesity, let alone in an event that explicitly targets kids under 12? Horrifying, short-sighted, and just plain stupid. Oh, and hey, Coca-Cola, I had a peek at your "commitment" regarding the Children's Advertising Initiative. "We are committed not to directly market messages for any of our beverages to children under 12." at an event where your marketing hook is that kids under 12 get in free, constitute directly marketing your messages to the very population you're apparently "committed" to not directly market to? Thankfully Coca-Cola, the copy of your commitment I looked at is electronic. I'm thankful of course, because it clearly wouldn't have been worth the paper I'd have had to print it on.